The comedian is unstoppable right now. Fresh off the success of Nowhere Fast, Alison’s latest series for RTE is a little realer. She sets off around rural Ireland to get some first hand experience with Ireland’s culchiest of culchies. She’ll learn to drive a tractor, jive, as well as hearing about rural upbringings and isolation, as well as hearing from bloggers, comedians, and even a rural drag queen. C’MON, you know you want to watch this. 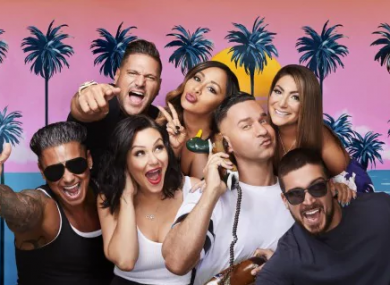 The Jersey Shore crew are back. The crew that launched Geordie Shore, Tallafornia, and everything that came after. Gym Tan Laundry, the cabs are here, get on it. A new drama series about life time friends Linda, Gail, and Sue as they navigate life together, including many difficult moments. If the reviews of this are anything to go by, you should definitely check it out. If you were a fan of Can’t Cope Won’t Cope and Aisling’s escapades, you don’t have long to wait for a new series. Series two is coming to RTE on April 23. Excitement. The Handmaid’s Tale (RTE 2, 10.30pm) The drama gets even darker this week. University Challenge (BBC 1, 8.30pm) Play along, if you dare. Travel Man (Channel 4, 8.30pm) Richard Ayoade is joined by Faye Ripley for 48 hours in Oslo. Made in Chelsea (e4, 9pm) It’s a reality TV bonanza tonight.